Frp duct rodder from the traction strength, flexibility, anti-aging, temperature resistance, anti-acid level and so has a very good effect, the location of the traction head is a special material, human 360-degree wheel design, more Can effectively through the elbow, so that no longer have to worry about the elbow, its unique connection, making the threader to use more convenient and longer life. In the project, the threading device is mainly used for the installation of dark lines in buildings, as well as the traction guiding rope in the pipeline, and can also be used to arm communication cables, power cables, network cables and video cables, which is very simple to operate and can greatly improve work efficiency , Is a very efficient power construction tools and communications construction tools. 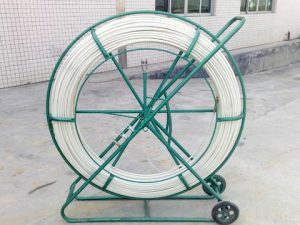 The construction process, first of all should be laid out a reasonable direction of the line pipe, and the line pipe is fixed, the frp duct rodder through either end of the tube, the other end of the tube pulled out a short section, and then will need to enter the line The wires of each pipe of the pipe are cut to about 5 cm, and a bare wire is inserted into the small hole of the threading device to fasten it securely. If there are multiple lines that need to enter the same bobbin, they need to be twisted together and then Wrap with tape The last one pulls one end of the threader and the other slowly pulls the wire into the bobbin at the other end.